If you're a M.A.C addict, chances are you've heard of the wonder that is Dazzleglass. 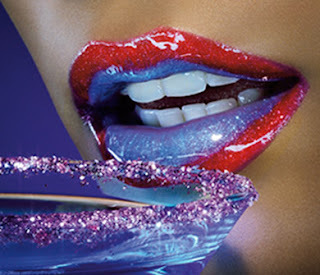 This highly pigmented, seriously sparkly gloss has lipgloss fanatics in a total tizzy! And who could blame them, after a glance at the gorgeous promotional photo? As soon as this beauty chick saw it, I was clambering after the gorgeous glosses. So how do these glosses get so incredibly sparkly? M.A.C has infused each gloss with electro-pearl atoms, high-shine and large particle quartz and opal crystal to really bring out that glittering sheen. And trust me when I say these are some of the glitteriest glosses I've ever laid my eyes on! While the texture is a bit stickier than I normally prefer, they just look so amazing layered over other glosses and lipsticks that I let that one less-than-perfect attribute slide. Plus, they smell like vanilla -- and as that's one of my all-time favorite scents, that makes the slight tackiness okay in my book! Each gloss is designed in a slightly thicker tube than M.A.C Lipglass -- and while you get a tiny bit less in the tube (.06 oz. compared to .17 oz. in the Lipglass), the color and pigment actually make you need less upon application. I love the brush, which is just thick enough to really make the gloss glide over the lips while not so thick that it makes you draw outside the lines! Each Dazzleglass retails for $16.50. The collection is available on M.A.C's website -- though the colors are selling out quickly! They are also available at M.A.C counters and stores nationwide. Simply dazzling.